At Borden Family Dentistry, we utilize the latest dental technology, in order to provide you with the best treatment possible. Solea takes the stress out of dental visits. With the Solea Dental Laser, Dr. Borden is able to perform many hard and soft tissue procedures without the use of a needle, drill or anesthesia. Patients love that there is no blood and many say no pain and no strange numbness during and after their dental procedures. 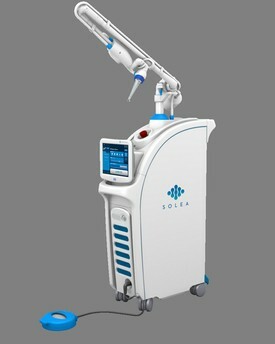 Ask us how the Solea Dental Laser can make your treatment plan a relaxing and virtually pain free one! Cone beam imaging, while a relatively new technology to dentistry, has already radically transformed the way that we as dentists can gather information, with the result being an ability to diagnose and treatment plan in a manner that previously could not even be imagined. The transformation from interpreting two-dimensional information to diagnosing from 3-D imaging, which allows for visualization of all structures in any given field, is a quantum leap … and one that has forever altered the way we must practice dentistry. This new dental technology is an alternative to the traditional crown process. The traditional crown requires multiple appointments and the process can take several weeks…having impressions made, a temporary placed, impressions sent to an off site lab, the crown created, the crown sent back to our office, and finally, the restoration placed for the patient. We wanted to better meet the needs of our patients, the same day crown technology does just that! This technology eliminates the need for impressions, temporaries, and most of all, wait time! Our training with the E4D allows us to take a digital scan of the tooth, with those images then transferred to our in-office design center. We are then able to create a natural looking, custom, permanent restoration with the unique characteristics of the patient’s tooth, in our own milling station. The in office created crown can then be placed the same day! The Diagnodent laser is an important tool in the detection and diagnosis of carries. Our office uses this innovate tool to scan patients mouths, with laser and audio signal registering digital read outs. This technology helps to detect decay earlier and also finds decay in areas where it may otherwise be undetectable. In addition to a good visual examination of the mouth, we want to raise the standard of examination for our patients. With that, an increasingly important technological tool that we utilize at Borden Family Dentistry is the Velscope. This technology uses blue light to contrast between normal and abnormal tissue. We strongly encourage the use of the Velscope with our patients, as it has proven useful as a screening device to assist in the detection of cancerous and precancerous lesions. Our office uses digital radiographs, or digital xrays. This practice uses a small camera that is placed in the patient’s mouth, allowing an image to be sent immediately to the chairside computer. The benefits of this technology for our patients, include a reduced exposure to radiation and more patient involvement in the diagnosis and understanding of treatment, due to the instant display digital imaging provides. Ultimately, digital radiographs are safer, more efficient, and provide better diagnostic images for treatment planning. Intraoral cameras are a primary tool in patient education. A pen sized piece of equipment, with a small lens on the end, this new technology is extremely effective in helping to show our patients exactly what is going on inside their mouths. The images produced from the camera highlight areas of attention that patients typically may be unable to see. The ability to view these images of potential cavities, gum disease, and other dental concerns enable patients to better understand diagnoses and treatment options.